I don’t mean that I don’t get why they’re used or funny (like the way I don’t get the usefulness of mason jars). I mean that I don’t get how they exist. Aren’t they straight out of Harry Potter? Where do they come from? How are they made? I can’t be the only one with these questions. That’s not an explanation, Katie. Nice try. Mom beat you to the punch there. I don’t quite get that either. But that’s an entirely different direction. We will not go there. GIFs though. So many questions. Is it GIF, as in Guh-if? Is it GIF, as in choosey Moms choose GIF (Jif)? I was using the GIF (Jif) pronunciation (which could have something to do with my love of peanut butter), but some super cool people say GIF (Guh-if). I just don’t know! When I ask people they say they don’t know either, but in that way that makes me think they really do know (and they’re just not telling me). How does a GIF act like an image? If I search for GIFs (which I almost never do because I’m afraid of them), I look in the “images” section of Google. This doesn’t make sense; they’re like miniature videos. There should be a “magic image” section of Google for GIFs. I don’t get it! How? How? How? Seriously, the only conclusion I can come up with here is that wizards are real. It almost NEVER happens, but sometimes the movie is better than the book. No, I’m not talking about Harry Potter, you crazy people. Seriously, people who say the Harry Potter movies were better than the books have not read the series. Anyway, here’s an article. Nay! An exposé in Lydia Mag where I uncover the five exceptions to the film adaptation norm. It’s shocking! It’s hard-hitting! It’s journalism! It’s… not that big of a deal. I know the saying goes, “Happy wife, happy life,” but I’m not a wife. I’ll just work with what I’ve got: a dog and a desk. Estelle Getty better be happy. She’s a dog. I treat her like a person half the time. Be thankful, Estelle Getty. My desk on the other hand is often… how should I put it? In disarray? A pigsty? Good luck spending the next hour looking for the checkbook? I think all of those are pretty accurate. But not for today. No. Today my desk is clean. This is important because I’m a little obsessed with writing spaces. I have two desks, kind of. I really have one corner desk that is always clean and pristine and gets the perfect amount of light for writing. Something I’ve learned about writing though: the desk doesn’t matter half as much as the chair. 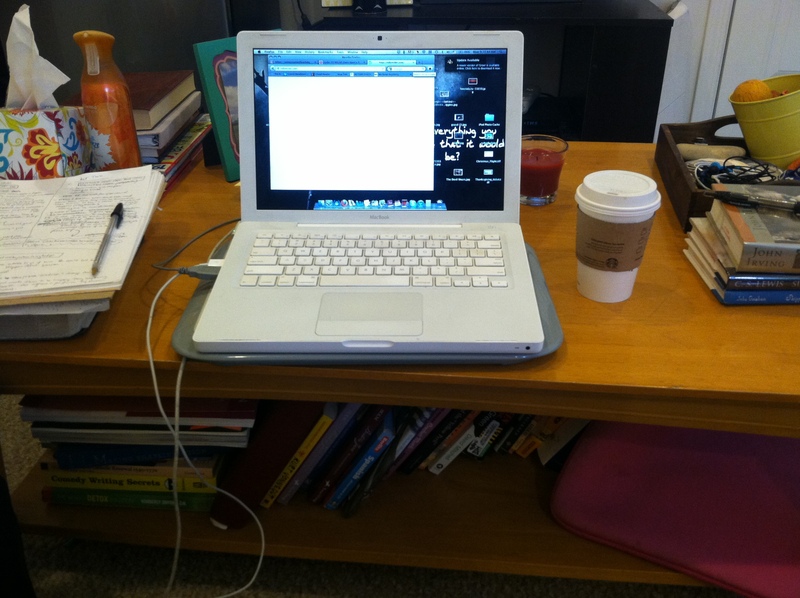 Therefore, I mainly use my other desk *cough* coffee table *cough* because I get to sit on very comfortable couch. I would love to use my spectacular chair I got for last year’s birthday (thanks, Mom and Dad! ), but it’s slightly too large to go near a desk, meaning I’m left with only my lap space. Why do writing spaces matter? I’d like to say it’s because I spend so much time there, which I do, writing or not. But I think they matter to me mainly because I’ve romanticized them so much. I romanticize things. It’s sort of a problem. What things? British accents and Mickey Mouse ice cream bars and handwritten letters and old cars. Strike handwritten letters. They’re actually pretty romantic. But, the point is yes, these writing spaces are just spaces, but they’re also personality reflections and creative inspiration and neat. I can’t be the only one that thinks they’re cool. In fact, I know I’m not (because my mom likes them, too). You know who really got the idea of a writing space? Mr. Roald Dahl. I love Roald Dahl for many reasons, including whizpopping. 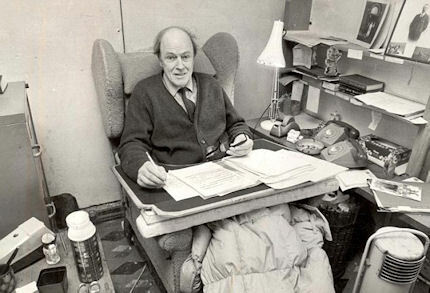 Roald Dahl wrote in a big, comfy chair with a lap desk, big blanket, thermos of hot chocolate, and sharpened No. 2 pencils. What a beautiful way to live. See? Definitely romanticized. 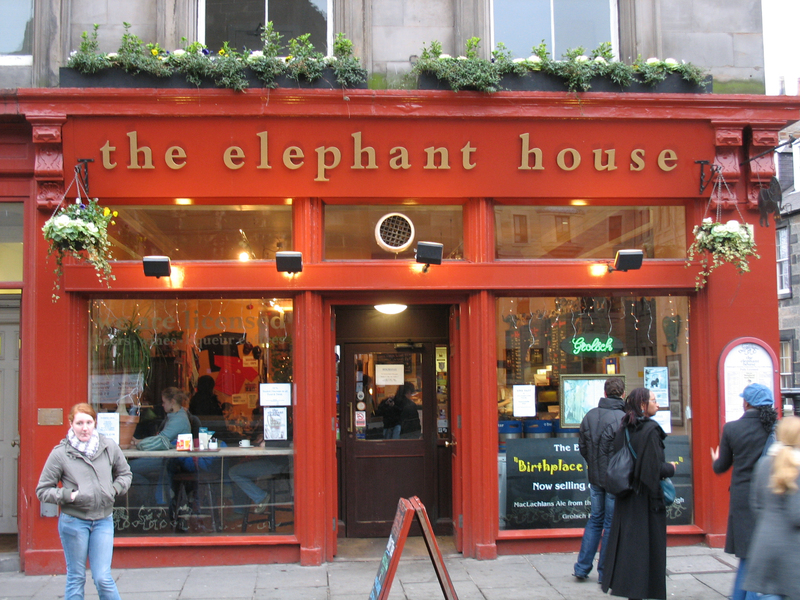 J.K. Rowling wrote Harry Potter (the first one) at a Edinburgh restaurant, The Elephant House. 1. How cool of a name is “The Elephant House”? Super cool. 2. Writing in a public place everyday sounds… rough. 3. I am so impressed by Rowling’s ability to write an entire book (never mind writing Harry Potter) with her pants on the whole time. Wow. 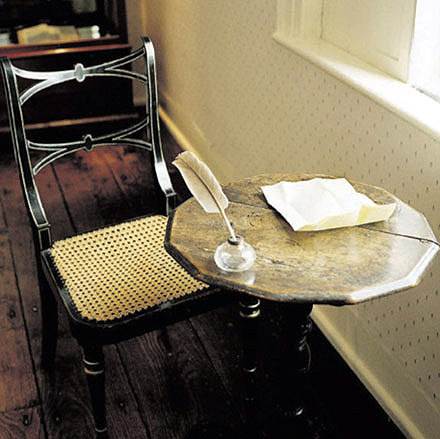 How could I NOT talk about Jane Austen’s tiniest of tables? And I complain about not having enough room. How crazy is it that Austen competed six novels on a surface I wouldn’t deem large enough to eat dinner on? Oh, Jane, you’re nothing short of fabulous, even in all of your tiny desk glory. I’m noticing a British pattern… you know how I feel about the accent. Stephen King’s room. If nothing else will sell you, On Writing will make you believe that you have to have a designated, poetically beautiful writing space. Oh, it will also make you realize that you are most likely a very bad writer, but that’s besides the point. 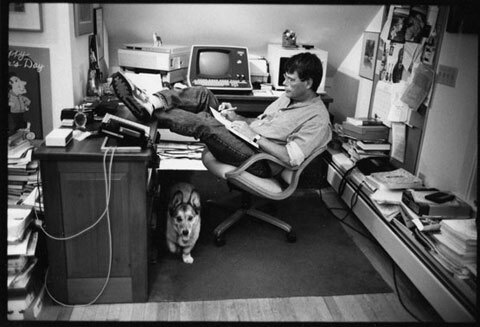 In King’s words: “It starts with this: put your desk in the corner, and every time you sit down there to write, remind yourself why it isn’t in the middle of the room. Life isn’t a support system for art. It’s the other way around.” See? He’s romantic, too. What I’ve realized (King: “No passive voice!”) through our writing space journey is that the most important writing space has nothing to do with my desk. It’s that room in my head where I lock everyone else out, especially the fourteen year old who tries to compare me to other people, until I let her come in because I have a fourteen year old character. It’s the place where I figure things out and go new places. It’s the place where I don’t think too much. I explore. It’s the place of adventure and fear and frustration. And most importantly, it’s the place that doesn’t define my life. It’s the other way around. I’m a bit of an oddball. This is telling, and as a writer, I need to show not tell. Well, I will show you (in the form of a story) that I am an oddball. I am a sleep laugher. I know what you’re thinking: “Hilary, please. You laugh all the time. You’re a bad stand-up comic’s dream. This does not impress us.” Well, fine. I’m not trying to impress you. Maybe I am a little bit, but not any more than a little, okay? It was during this period of paradise living that I was sleeping in the living room of a little apartment, as was my brother. (I said we we were in Hawaii, not that we were rich in Hawaii.) In my sleep, I dreamed, as I do almost every night. I wish I could remember this particular dream more vividly, but all I can tell you is that I was talking to Tom Felton, whose hair had fallen out from getting bleached in Harry Potter. And I told him that his wig looked “so bad.” In the dream world, this was hysterical. Here’s the thing; this has not been a one-time occurrence. Hawaii was the first, but it has happened several times since, always spurred on by some brilliant “joke” I’ve made in the dream like, “Tom Felton, that wig is so bad.” Wahahahaha. Man, I got him. 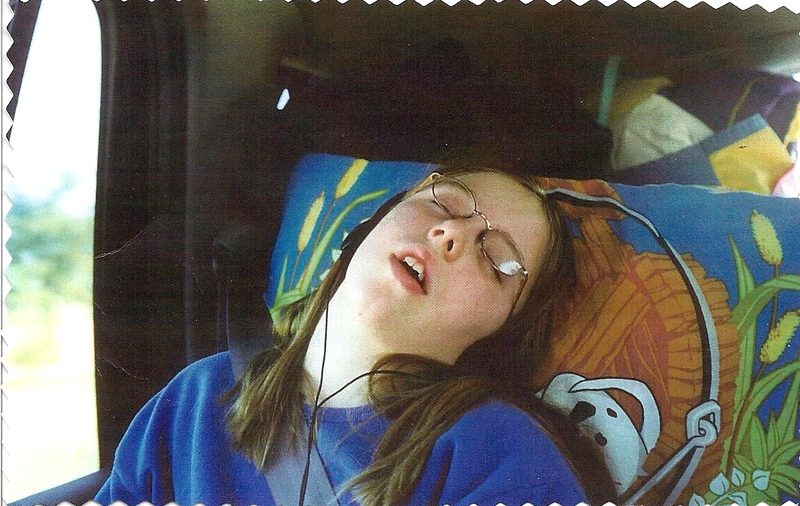 Here’s a really fantastic picture of me sleeping (there are many). Disclaimer: this was pre-braces. Let’s just say that dream-world Hilary is out of her mind. I used to keep a dream journal next to my bed, fill it out, and then read through it in the morning, without remembering what I had written down. I stopped that. Sometimes, I had good stuff, sure, like “pizza with caramel crust” or “married Will Power” or “Jon Bon Jovi is a charter school radio host.” However, there’s only so many times you can read “beards for breastfeeding” and “tall Chinese jumping man with many jacuzzi fish” and “become an old folks trainer” before you say this is deeper into my mind than I’m willing to go. For now, I just know that I’m an oddball and a sleep laugher, which is sort of like a sleep walker, but louder and more obnoxious and less dangerous.